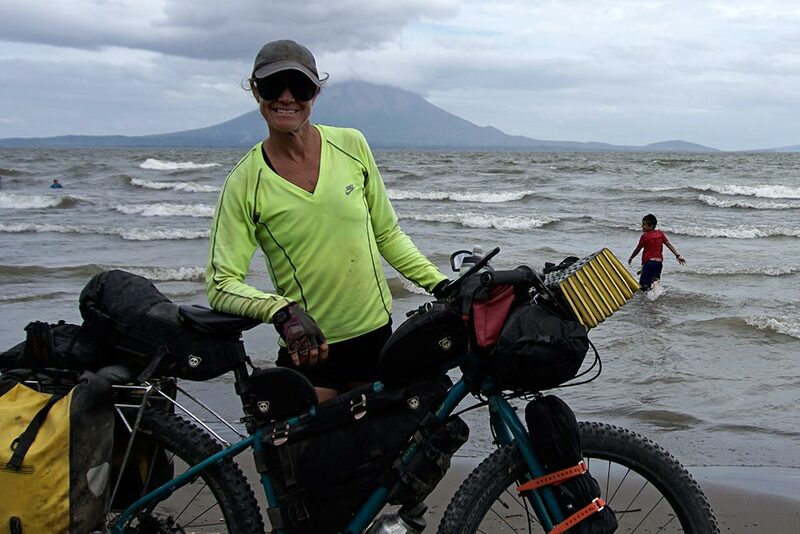 There are some who, when planning a bicycle trip of the Americas, strive to follow the most direct route possible. There are others though who, perhaps less constrained by time limitations, follow a more circuitous route, endeavoring to take in as many hot spots as possible along the way. 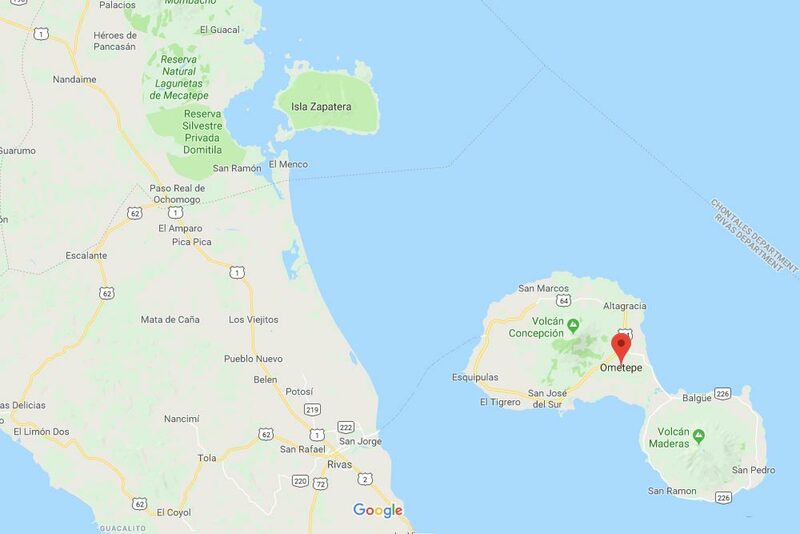 While still definitely drawn towards our objective, I believe that we more closely fall into the latter category, and our recent side trip to Ometepe Island is a perfect example of this. 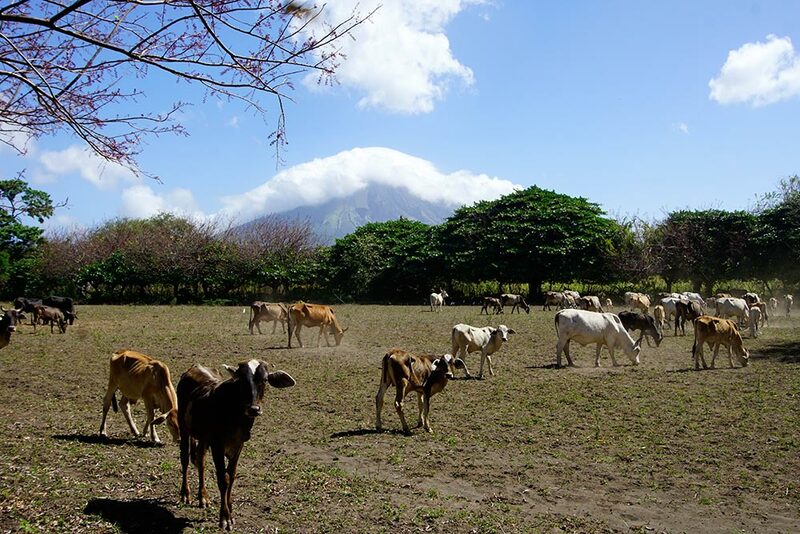 On the shore of Lake Nicaragua, Ometepe Island in the distance. 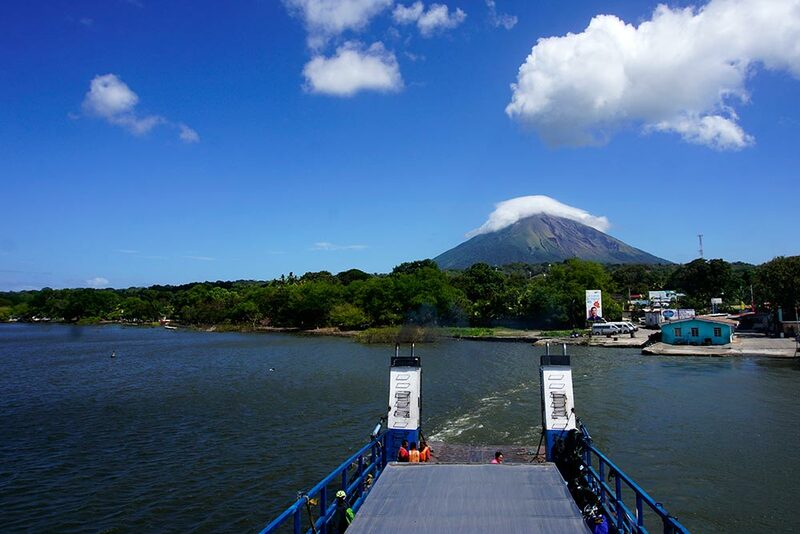 We traveled to Ometepe Island from the port of San Jorge. Rebecca and Wilbert during the ferry ride to the island. 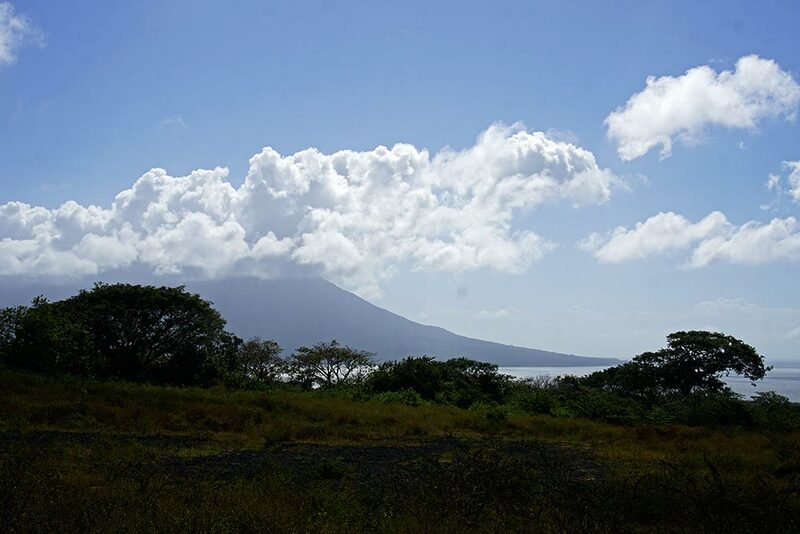 Volcan Conception, the larger of the two volcanos on the island. 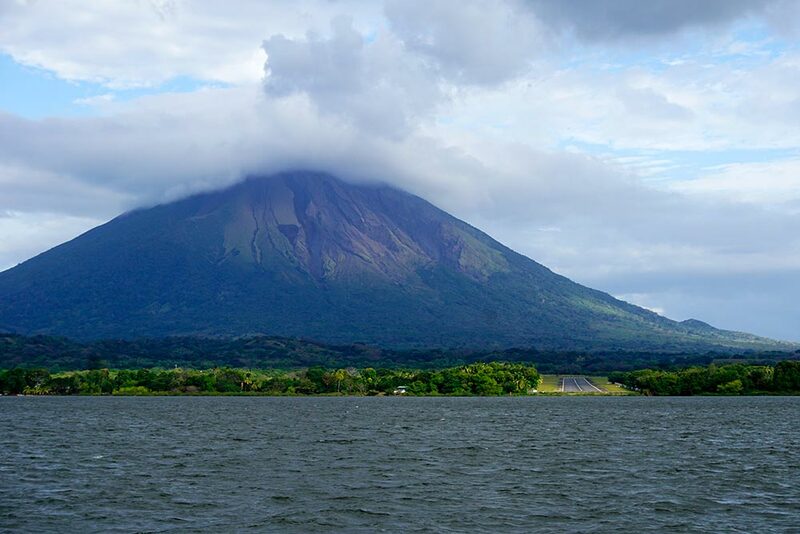 The twin volcano island of Ometepe sits close to the westernmost shore of Lake Nicaragua. It is easily accessed by ferry from the port of San Jorge and is well visited by tourists. 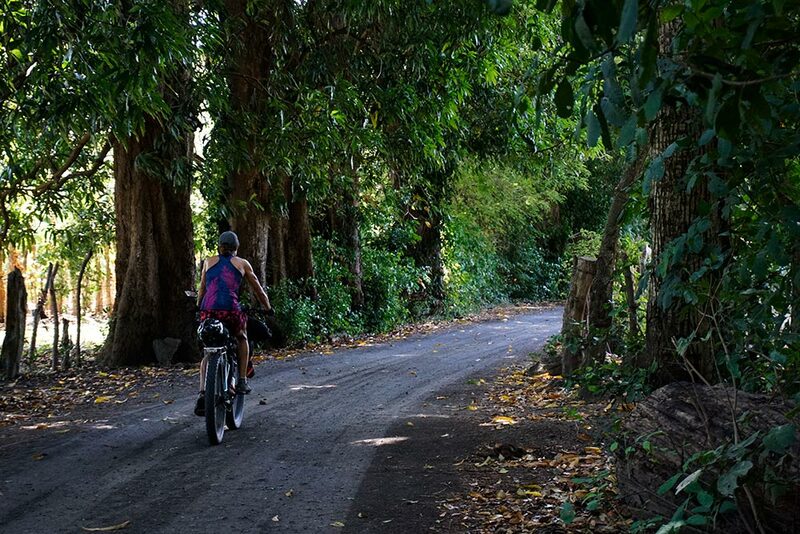 We took note that many cyclists have visited the island including some of our friends. Bikepacking.com also published a GPS track for those wishing to travel around it, although such a track is not really necessary as it would be pretty tough to get lost. Good to know. Last eruption 2010! Our day started off beautiful but partly cloudy. Partly cloudy soon turned to a brief but intense rain squall. 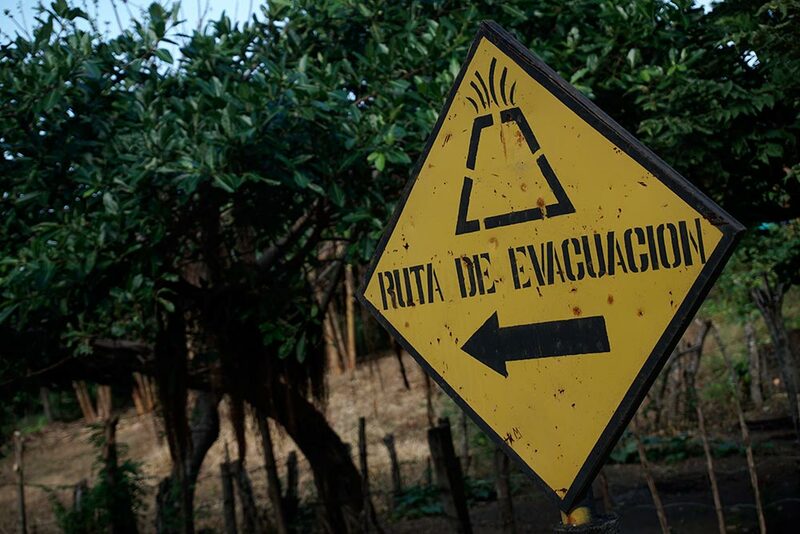 From the town of El Astillero, we set off early to make our way to the shore of Lake Nicaragua. Expecting the route to the lake to be somewhat like the horse path we took to get to the coast, we were pleasantly surprised to find that the road was an actual road, not a path, and that it was paved for a good portion, a benefit due to the fact that we had a fair bit of climbing ahead of us. 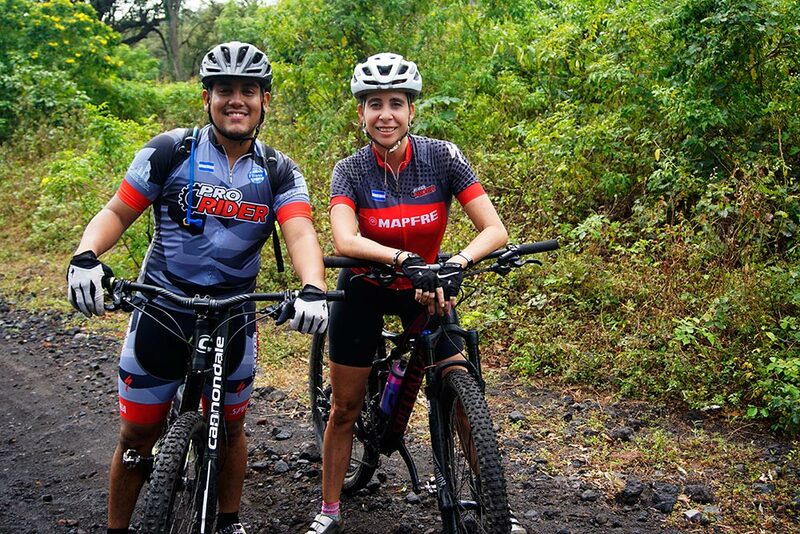 This couple from Managua was riding around the island. On lightweight unloaded bikes, I bet it was fun. Many of the roads were nicely shaded. Arriving at the shoreline in the early afternoon, we had just enough time to enjoy a cold beverage by the beach before boarding the ferry. It was while waiting for the ferry to depart that we first made the acquaintance of Wilbert, a cyclist from Holland who was heading north. I say first because even though we traveled independently, we would end up crossing paths with him numerous times during our two days on the island. Obviously used to being fed by people. 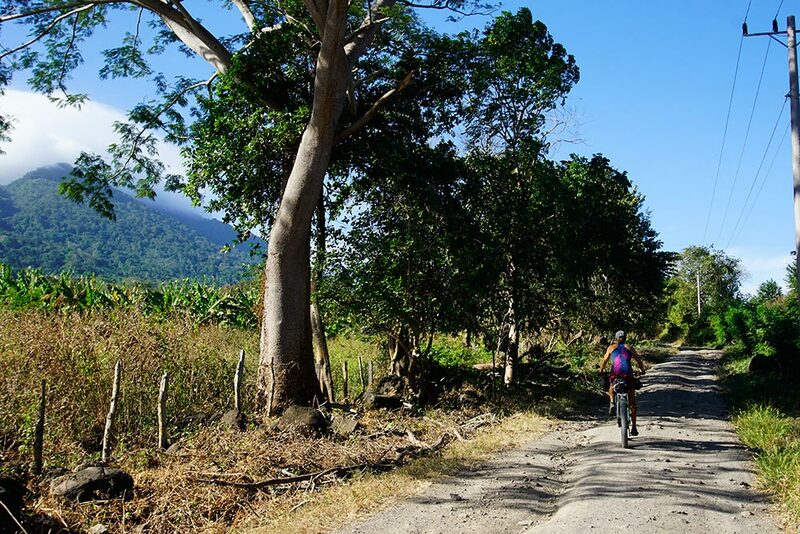 Late afternoon climb on some rough roads, Volcan Maderas to the left. One might think that following a coastal road on a small island would involve very little climbing but it would be a serious mistake to assume that. 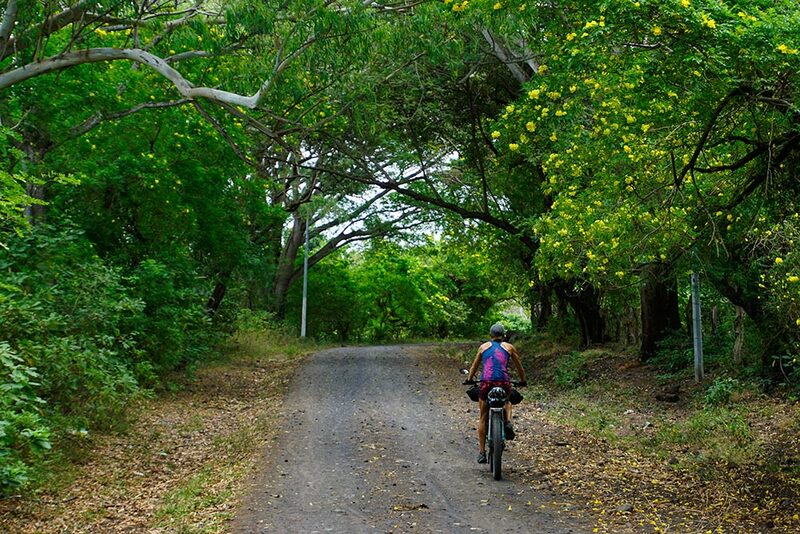 The fact is that riding the route around the perimeter of Ometepe Island necessitated a lot of climbing, on paths that were somewhat equally divided between nicely-paved roads and absolutely terrible ones! 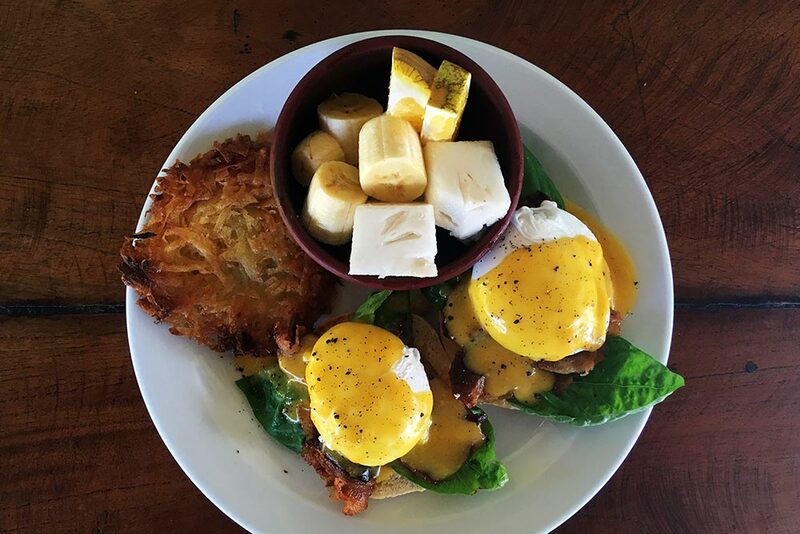 Excellent fuel for a day of riding! 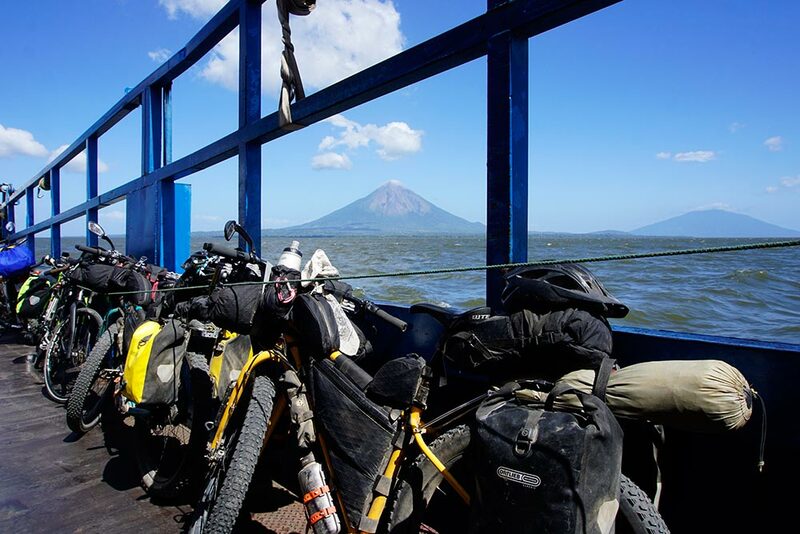 Our bikes, partially unloaded for the trip around the island. 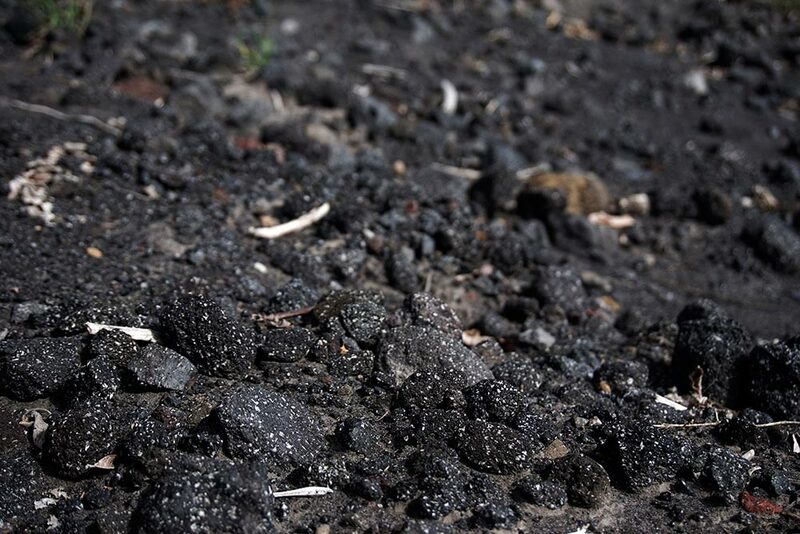 You can see tracks from past lava flows. 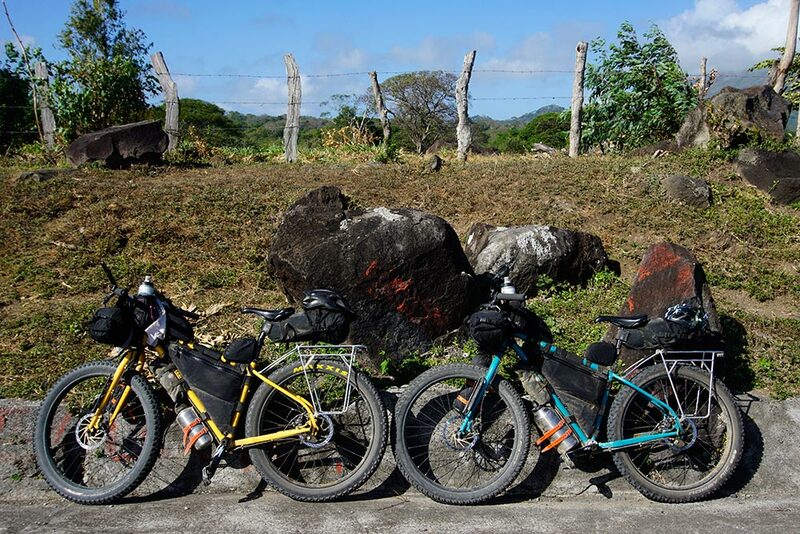 Even though a fast rider could circle the entire island in one day — and in fact, we met a couple doing just that — we planned to split the ride up into two. To make our job even easier, we left a good chunk of our luggage at Hospedaje Central, the hotel we stayed at in the port town of Moyogalpa. This included, among other things, all of our camping gear. Once we started climbing on the rough roads, we were very happy that we had done so! Volcan Maderas in the distance. At one point during the ride, I saw a small black and white creature scurry across the road in front of us. What I initially thought to be a skunk turned out to be a monkey, one that was obviously quite used to having tourists feeding it. 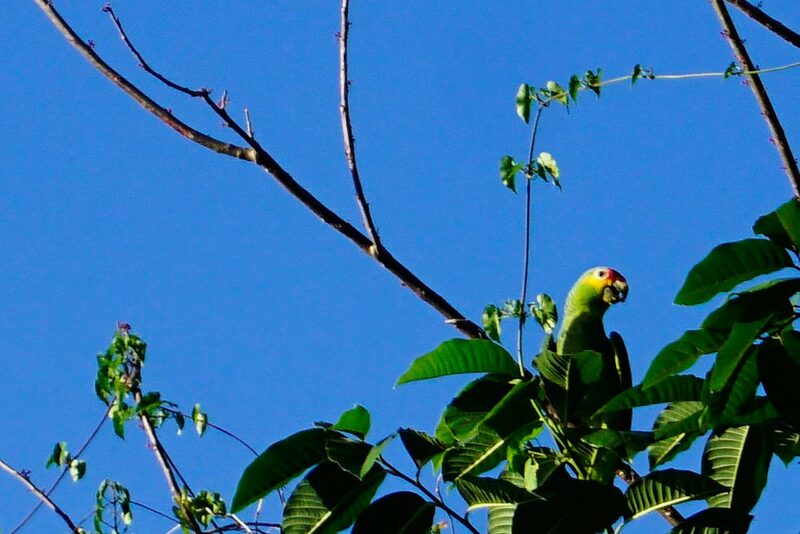 Later that same day, we came across some bright green macaws, our first sighting. 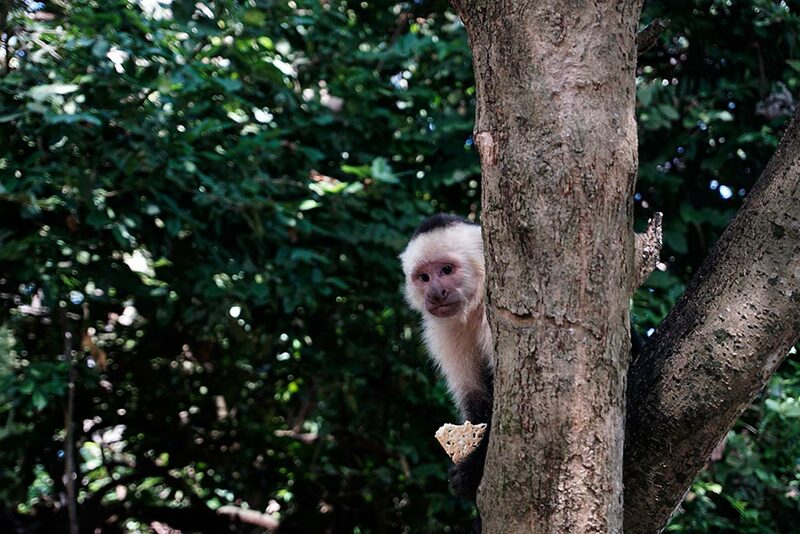 I find it funny that we had to travel to an island to find monkeys and macaws. 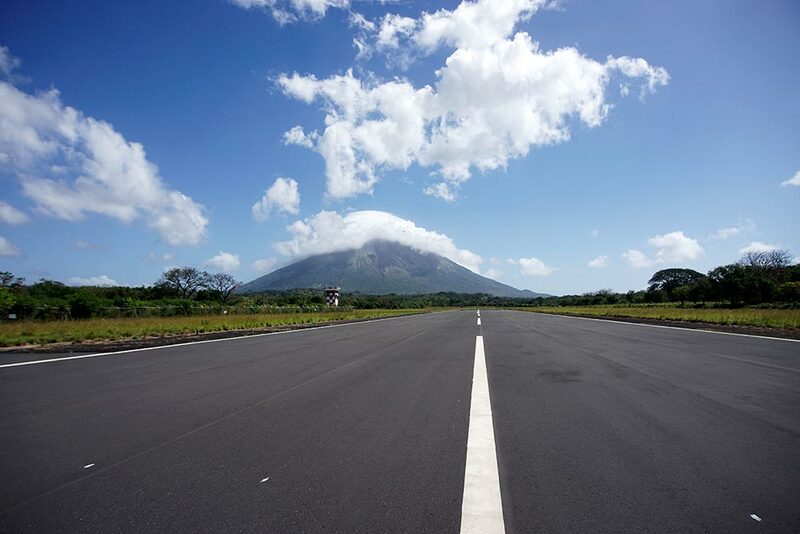 The airstrip which services the island. Making ready to cast off lines. Without having planned it, we managed to knock off the most difficult section of riding the first day that we were there. That meant that we were able to make it back to the hostel to pick up our luggage just before noon on the following day. 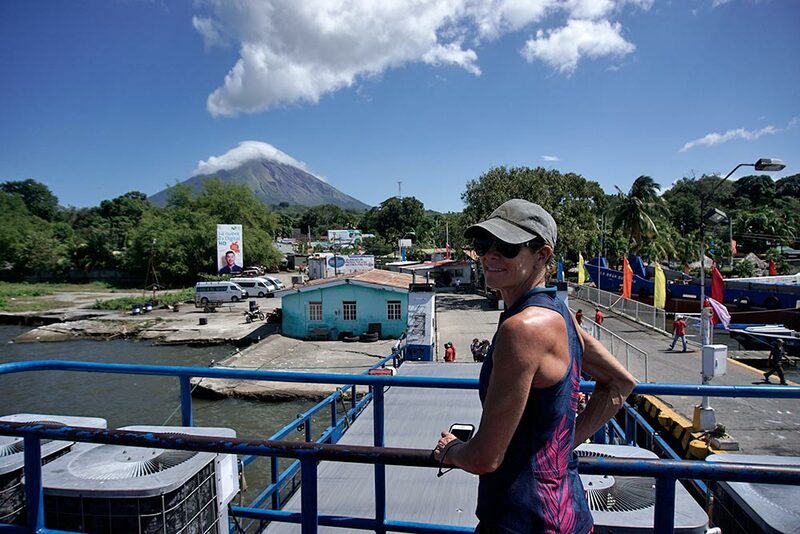 As the ferry trip takes a good hour, we decided to return to the mainland to stage for our ride to the Nicaragua/Costa Rica border. 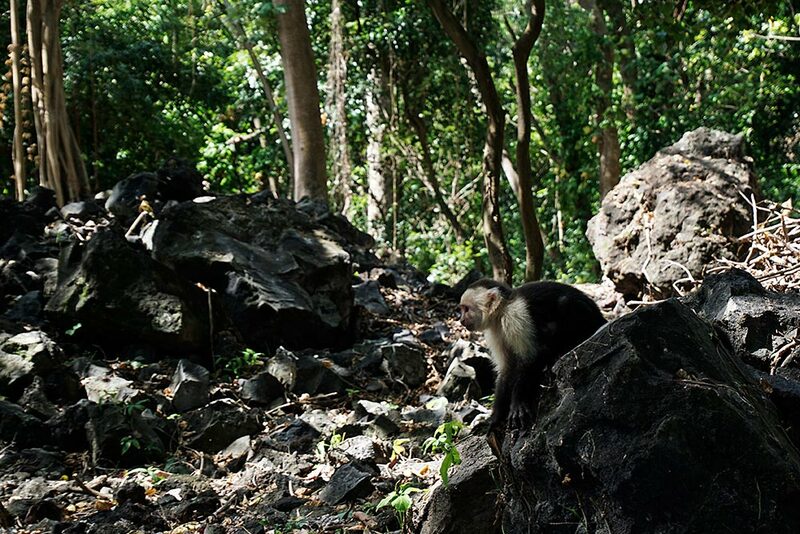 Would we recommend a visit to Ometepe Island? Without question. 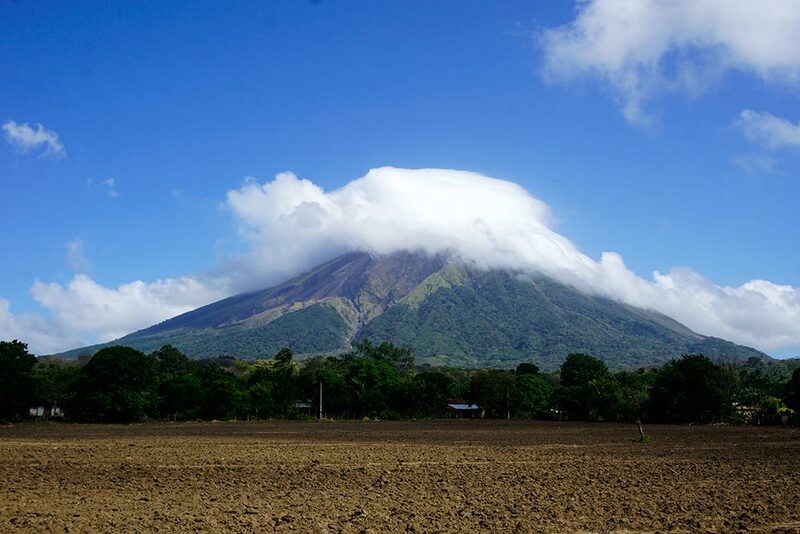 In fact, I’d love to return there someday to hike to the top of the volcanoes. 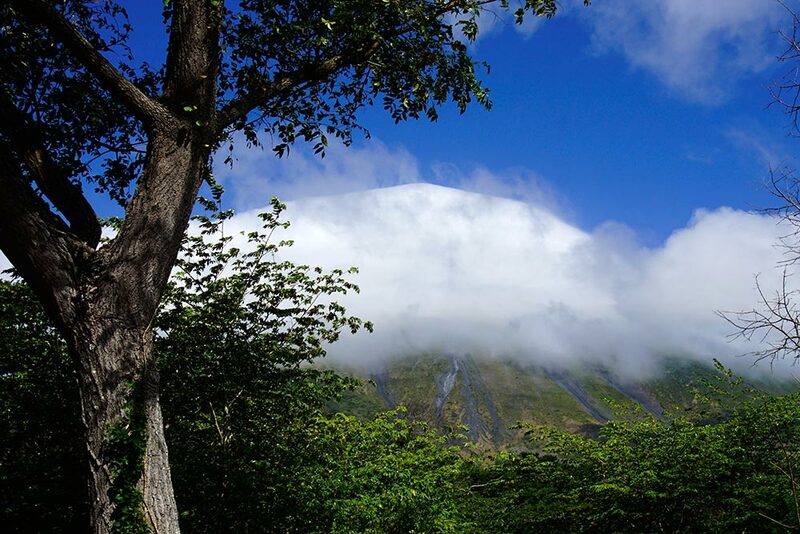 We were definitely tempted to climb at least one of them while there but Costa Rica was calling to us. It’s OK though. 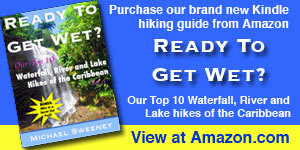 By saving a few fun things like these hikes, we’ll be more motivated than ever to make a return trip to the area. 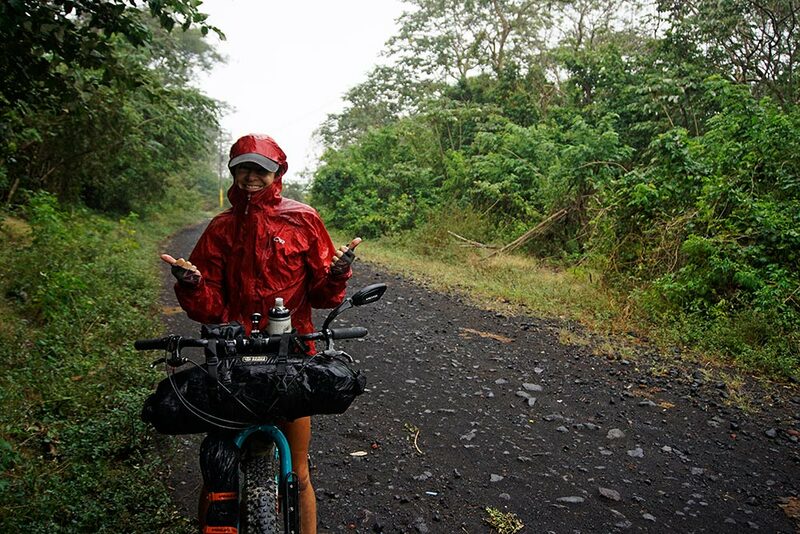 Next PostCosta Rica really blows! Hi Kids– Very Cool Stuff..
Love following your Blog– It’s been a adventure ever since you untied the Lines in Canada.. Thanks for sharing.. Thanks, Janice. The only timeline we really need to adhere to is Mother Nature’s, meaning that we want to be in Patagonia a year from now during the austral summer.